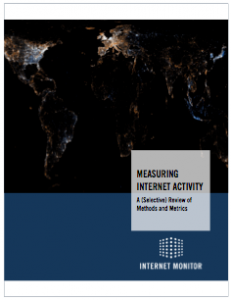 Internet Monitor is delighted to announce the publication of “Measuring Internet Activity: A (Selective) Review of Methods and Metrics,” the second in a series of special reports that focus on key events and new developments in Internet freedom, incorporating technical, legal, social, and political analyses. This entry was posted in IM Research & Publications by Rebekah Heacock Jones. Bookmark the permalink. Rebekah Heacock Jones is a Senior Project Manager at the Berkman Center, where she focuses on Internet health, Internet governance, and access to information.